At the flick of a switch, Polyvision™ transforms from a dormant, cloudy-white translucent state to a crystal-clear, transparent state. 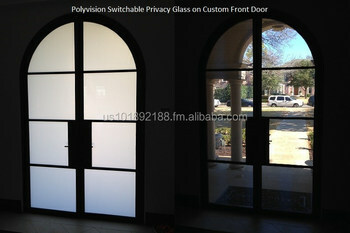 Polyvision™ provides creative design applications for architects and other innovative and practical users. When the power is off, the liquid crystal molecules are randomly oriented so that incident light is scattered, and the glass is opaque. When electricity is applied, the liquid crystal molecules line up, the incident light passes through, and the glass becomes clear. Polyvision™ products are available in custom sizes and shapes to match your creative designs.